Despite being the son of a wealthy renowned bioengineer, Ashton Collins is just your ordinary teenager. In fact, due to his strict and protective upbringing, Ash is probably much more sheltered than the average kid. But when he is ambushed in his home by a squadron of armed invaders, he finds himself on his own and without anyone to turn to. His only lifeline is a panicked message from his father right before the attack cut the feed, telling Ash to head to the Red Zone, located in the dangerous heart of Los Angeles, in order to find a group known as the Street Freaks. Once in the Red Zone, Ash finds himself swallowed up by this futuristic dystopian mega-city, a world he knows next to nothing about. Luckily, the Street Freaks find him before he can get into too much trouble, inviting him into their circle. They’re a band of adolescent outcasts, including a young woman with super-strength, a boy with more robot than human parts, a synth created to be pleasure bot, and many others. Brought together by the street racing scene, the Freaks also run a vigilante-style operation on the side, and Ash’s photographic memory and near perfect recall are skills that immediately make him an asset. But Ash is also on a personal mission to find answers, like the identity of those responsible for the attack on his home. News of his father’s death also turns his world upside down, though not for a second does Ash believe it was a suicide as reported. I confess, I’ve not been a big reader of Terry Brooks over the years, despite him being a huge name in fantasy fiction. 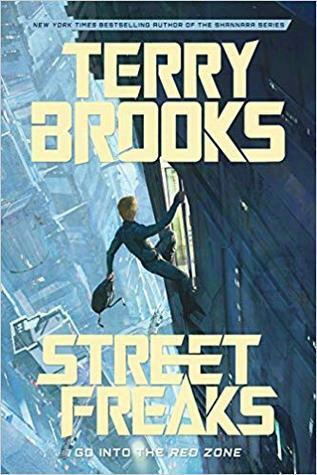 That said, I know enough about his work to know Street Freaks is a bit of a departure for him, exploring the sci-fi dystopian landscape with a Young Adult bent. However, what I did not expect was how skewed it was towards younger readers, for it does not feel as though it carries much crossover appeal, unlike a lot of Brooks’ other work. While the characters are likeable, they’re still very much the teenagers they’re supposed to be—impulsive, snarky, somewhat hot-headed and volatile and oftentimes immature. For fans of the YA genre who are familiar with the typical YA character shenanigans, I don’t think this will pose much of a problem, but for readers expecting something more serious and hard-hitting, you may find that Street Freaks has little to offer beyond surface-scratching territory. To its credit though, the book does reads like an action movie, the plot’s lack of depth be damned. The scenes of the street races were almost reminiscent of the podraces of Star Wars complete with roaring crowds and fiery explosions, and I can’t help but think Brooks might have been channeling a little from his time writing the novelization of The Phantom Menace. These types of action sequences, which bordered on blatantly gratuitous, were nonetheless entertaining and provided well-timed bursts of spirit and dynamism in between sections where the narrative attempted at discussing weightier topics, such as the ethics and social consequences of genetically or technologically enhancing humans. But ultimately, Street Freaks ended up being a rather typical YA sci-fi dystopian—though I don’t want to paint that as too much of a negative. The book is a mystery adventure-thriller, but at its heart also explores important coming-of-age themes such as finding yourself and seeking acceptance. Brooks’ style trends towards being lighter and not too subtle, which worked well in this particular case. However, his tendency to tell-versus-show made the romance (yes, of course there’s a romance arc) feel forced and awkward, and not even listening to this in audio made it any less cringey, though happily, this was probably the worst of my complaints. Bottom line, I won’t deny I wish Street Freaks had been more. Still, at the same time, it was also pretty much exactly as I expected, so I can’t say I was too disappointed. It’s certainly accessible enough for Terry Brooks fans coming from his fantasy, and to many, the fun and readability might be all that matters. Audiobook Comments: I make it no secret that I am a huge fan of Simon Vance, who is one of the most talented and versatile audiobook narrators in the industry. However, my first impression was that his voice might have been too mature for this very YA tale, though in the end he managed a fine job of it in any case. A good narrator can sometimes compensate for some weaknesses in the writing, and I felt Vance fleshed out a lot of the characters by bringing them to life with his voice. Wow. I had so many of the same thoughts on this one. I liked the world and some of the writing, but felt the plot was very predictable. Exactly! Cool world, interesting characters, but the story was full of cliches and overall unremarkable. I have to admit, when I saw this one I thought wow, this looks like a departure from Terry Brooks’ usual fare! And sounds like it is, but also a fairly pedestrian one too, unfortunately. I probably won’t read this but I’m glad I saw your review, as I was somewhat curious where he was going with this. Great review! Yeah, it’s a HUGE departure in theme, but sadly still the same stock ideas. I am kinda glad I did not request this. I have seen Terry’s name out there many times, but it does not mean all he puts out is good. Thanks for another great review. Exactly. He his name recognition and a loyal following, but yeah, I’m personally not a big fan of his writing. I have his Running with the Demon on my bookshelf but haven’t got to it yet. I did quit Armageddon’s Children years ago though so I’m not in a rush to read it! Yeah it appears you aren’t alone in feeling this way! I was never able to get into his books, so with everything else on my shelves screaming “read me,” I really have no desire to read him at this point. Yeah me neither, I should have just listened to my instincts! This is a pass for me. Thanks for the review, it doesn’t sound like something I would enjoy – not being a massive sci fi fan I tend to be a bit picky about the few books I do read in that genre.